I can remember it like it was yesterday. Playing with my dollhouse in my room for hours on end. My parents bought it for me when I was five or six-years-old from the Durban beach front. It was a glossy wooden two story house with pink shutters and it was kitted out with the cutest furniture. Playing with my dolls house allowed me to explore my imagination and I honestly must have played with it until I was well into my teens. I kept my dollhouse, just in case I had a girl and I could pass it onto her. Over 20-years later, it is safe to say that it is so old and weathered! I just knew the hand me down wouldn’t last her to one day possibly pass it onto her daughter and I wanted her to have something as special to her as my dollhouse was to me. Every little girl deserves a dream doll house and I always knew that I wanted to invest into a dollhouse she could one day play with for years and years like I did. When I came across Lil Peanut‘s dolls house on social media recently I literally went weak at the knees! I was lucky enough to be sent one for Maddie to own and love by Ross, the creator behind the incredible local classic wooden play sets and toy brand, Lil’ Peanut. 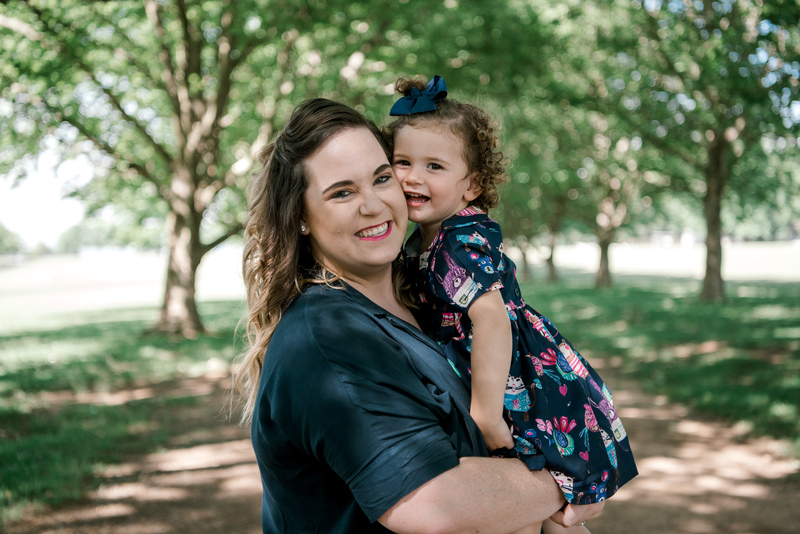 A dad himself (to a gorgeous three-year-old daughter), Ross started Lil’ Peanut nearly two years ago with the idea to provide quality wooden toys and accessories to parents who were in search of more than just the run of the mill cheap plastic toy. After some encouragement from his wife, Ross who has always been hands on with tools began his career in creating unique and creative wooden kitchen play toys that possessed the quality that of how grandpa used to make back in the day. Something that will last till your kids grow up and they can pass onto their kids. Let me introduce you to the doll’s house of you (and of course your child’s dreams). The gorgeous scandi wooden doll playhouse! This beautiful creation which is made from pine and MDF, has an open plan living area, a lounge and two rooms, including a penthouse bedroom kitted with astroturf grass and a frameless plexiglass balcony. The handcrafted furniture is my favourite part! The attention to detail from the Barbie picture on the TV to the handmade bedding and pillows! There is no detail left untouched. The house comes with two beds (including pillows and duvets), a large and spacious cupboard, a dressing table with a chair, a double seater as well as two single couches, a TV stand and TV, a fridge, counter top, oven/stove and a dining room table with two benches and two chairs. The house which stands 1.1m high from the ground has been built to Barbie’s size so she can stand at every level. It comes fully assembled with only four screws needing to be inserted to hold the top room in position! I couldn’t love this house more if I tried! Pictures don’t do it justice and I am so proud to have gifted this to our daughter to love for years and years! Lil’ Peanut is offering FIVE of my readers R1000 off the scandi wooden doll playhouse (which includes the dolls house and all the furniture) including delivery if you use the discount code Maddie1000. Please not there is an order lead time of seven days from placing your order.